Combo Bouncers offer the best in inflatable excitement. They get their name from the fact that they combine the popular bounce house feature with one or more exciting elements. The extra elements range from slides, obstacles, climbing features or basketball hoops. 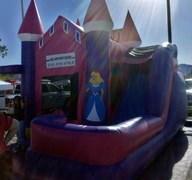 High Jump Party Rentals has a great selection of combination bouncer and slide rentals. Browse the rental units below and click on the "More Info" link for more information and to make a reservation. Combo Bouncers offer the best in inflatable excitement. They get their name from the fact that they combine the popular bounce house feature with one or more exciting elements. The extra elements range from slides, obstacles, climbing features or basketball hoops. High Jump Party Rentals has a great selection of combination bouncer and slide rentals. Browse the rental units below and click on the title or image for more information. Price is for up to 4 hours. $25 more for an additional 4 hours & +$25 to keep it all night. Must be scheduled until the next day with end time of 8:00 A.M.